Although I had been a vegetarian for 14 years and had never liked turkey when I was a meat eater, I wanted to raise turkeys when we moved to the country in 2002. I had discovered that most breeds of turkeys were in danger of extinction back in the late 1990s, and I wanted to be part of the solution. How could most breeds of turkeys have been in danger of extinction? Because almost all of the turkeys raised commercially in this country are a broad-breasted strain that was developed more than half a century ago. They have white feathers (so they’ll have cleaner carcasses) and huge breasts (because Americans prefer breast meat). 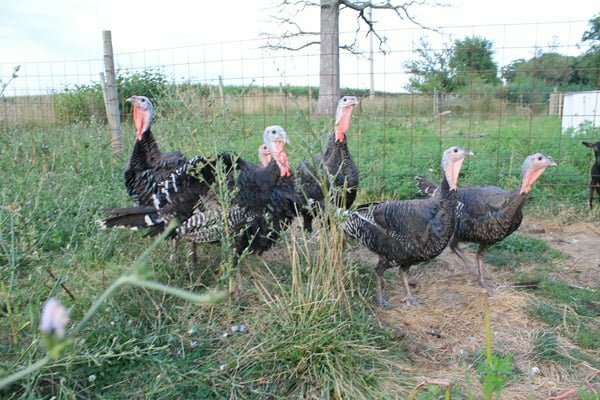 That means that the heritage breeds of turkeys, which have been around for centuries were being almost completely ignored. I met my first heritage turkeys at the Garfield Farm Rare Breed Show in 1997 when I was a reporter. I was totally enamored with the blue slate and bourbon red turkeys and saddened that there were only a few hundred left at that time. 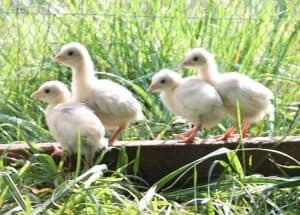 So, when we finally moved to our homestead in 2002, I bought ten poults of each breed. 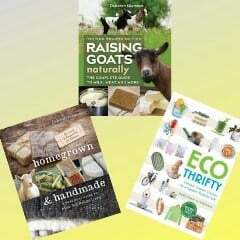 The books made turkey raising sound really hard. They said that turkeys would die if I didn’t put medication in their water, and they said that turkeys would die if they came in contact with chickens. I recalled that my grandparents had always had both turkeys and chickens running around on their farm, so I figured that if they could do it, so could I. I also decided to skip the medication for the water. In my mind, if the birds couldn’t survive without daily drugs, then maybe they didn’t deserve saving. Plus, I knew that prior to the 20th century, all animals survived organically, so I didn’t really think I was doing anything that radical. Here we are 15 years later, and we’ve had great success raising turkeys and chickens together — without drugs. In fact, a couple of years ago, I wrote this blog post about raising them together, which explains why we’d been successful in mixing the two species. 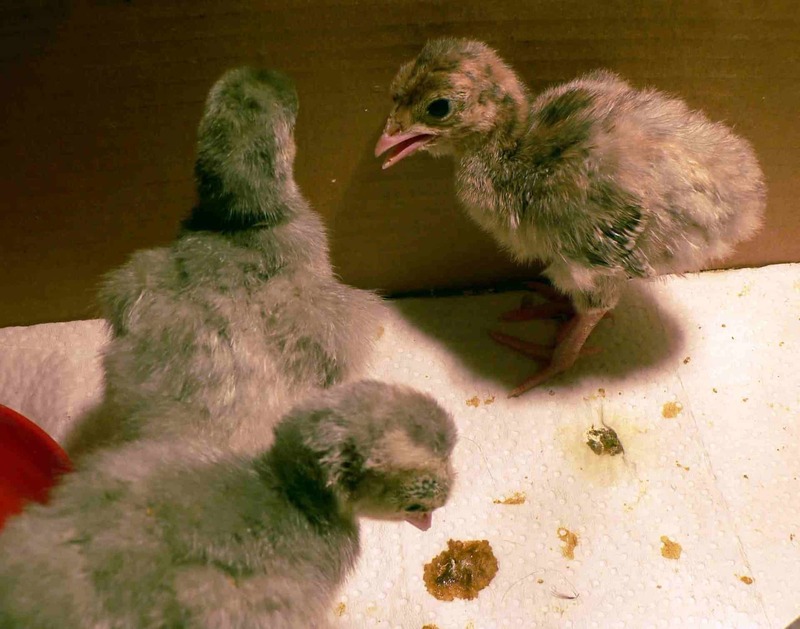 Sprinkle starter crumbles on white paper towels until turkey poults learn to eat from the feeder. Over the years, I’ve found that brooding turkeys isn’t any more complicated than brooding chickens. Although a lot of people have written about poults having trouble learning to eat, we’ve never had any problems. When we receive them from the hatchery, we put them in a box or old water trough with white paper towels on the bottom. Why white paper towels? Because we sprinkle starter feed on the paper towels, which makes it very easy for them to see. It’s a natural instinct for them to peck at anything that looks like a bug, so they immediately start pecking at the crumbles and eating. If they came from a hatchery, we dip their beaks in water so they understand that concept, plus to combat dehydration from their trip. However, if they’re hatched in an incubator on our farm, we just put them in the brooder, and they figure it all out on their own. In fact, we have almost zero mortality for poults hatched on our farm. That leads me to conclude that shipping stress is the reason we lose a few that we buy from hatcheries. 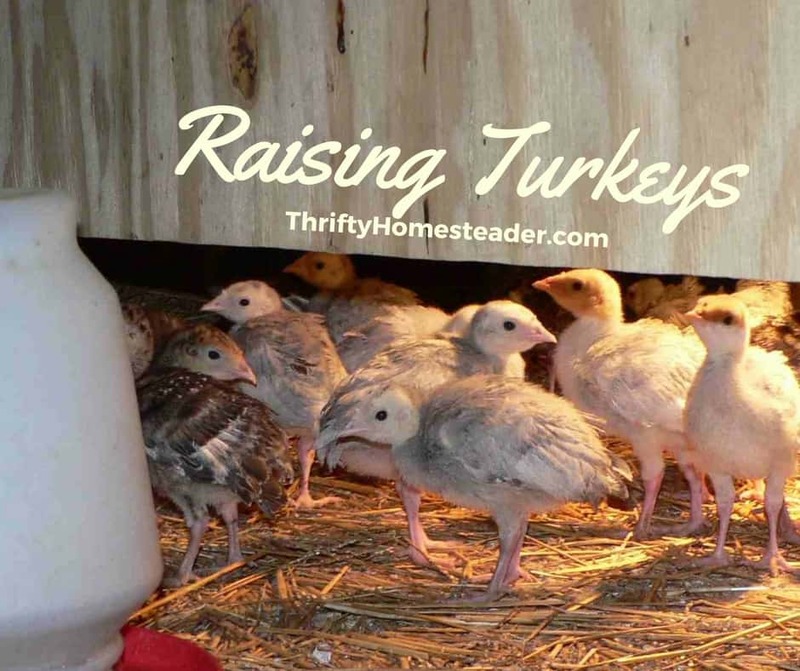 If mama turkey hens hatch babies, they do a great job of teaching them to do everything, so survival is also almost 100 percent. 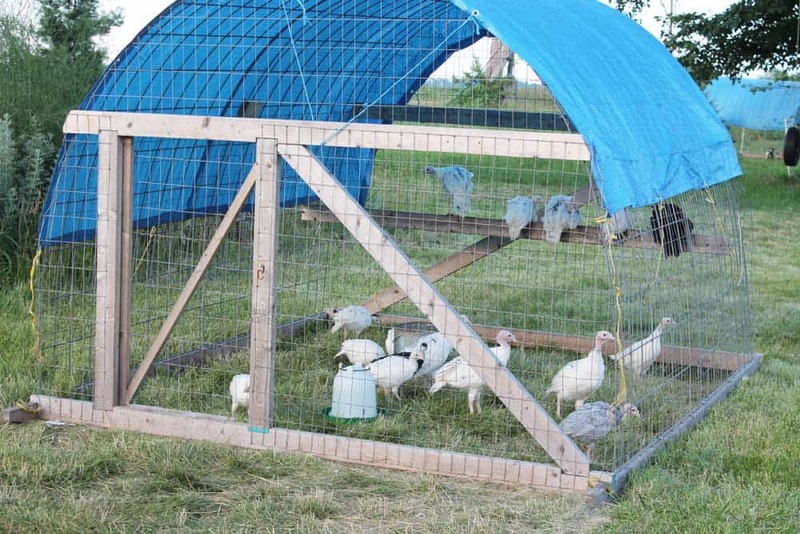 We put mama and babies in a chicken tractor so the poults are safe from predators. It also avoids the risk of them getting lost when mama runs through tall grass. We usually remove the mama when her babies are a couple of months old, although it’s not unusual for her to continue to roost on top of the chicken tractor for days or even weeks. When raising heritage turkeys, we use a chicken tractor because they can fly. They don’t fly away, but it does create problems when we need to catch them for processing. So, after two years of having to explain to customers that their turkeys flew up into a tall oak tree, we’ve started using the moveable pens. Since turkeys are so much bigger than chickens we can only get 7 to 10 mature turkeys in each of the tractors, depending upon whether it’s one of the 9 X 9 foot or 10 X 10 foot. When they are old enough to be on pasture, we will move 15 to 20 into a chicken tractor, and then as they start to get crowded, we split them into two groups. When raising broad-breasted turkeys, we let them free range. Their breasts are so big that they can’t fly. They can use their wings to help them jump up onto a fence or gate, but I guess they’re smart enough to know where they’re fed because (knock on wood) we’ve never had one jump down on the road side of the fence. Broad-breasted turkeys are bred to gain weight really fast and to have huge breasts. The first few years we raised them, we wound up with several becoming lame after only a few months. Bascially, they gained more weight than their bone structure could carry, and they wound up unable to walk. Ultimately, we began adjusting the amount of protein in their feed. Although turkeys start out with a much higher protein feed than chickens (24 to 27%), we found that we could reduce the amount of protein considerably with the broad breasted after 2-3 months. In fact, if we keep broad-breasted turkeys for four months or longer, we switch them to cracked corn at that age, which is very low protein. Keep in mind that they are on pasture, so they’re consuming bugs for additional protein. My best guess is that the commercial feeds are meant for birds in confinement that have no additional protein sources. Because the genes in these birds cause them to grow so fast, any extra protein (such as bugs on pasture) simply causes them to grow too fast. One of the best things about raising our own turkeys is that we eat them year round. Although we stick with the traditional roasted turkey for Thanksgiving, we fix turkey in a multitude of ways the rest of the year. 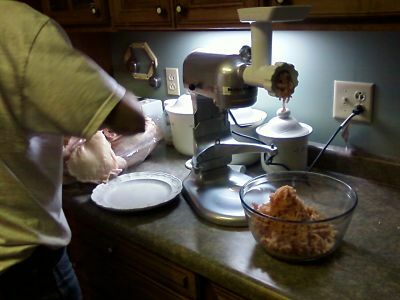 Grinding up breast meat and making burgers is one of my personal favorites. I also like cutting leg and thigh meat into strips and making schnitzel, which reminds me of chicken fried steak. Grinding up the dark meat also makes a tasty chili. Yes, that does mean that we gave up our vegetarian ways and began eating our own meat, and I also discovered that I love the flavor of free-range turkey meat. But because we know so much more now about raising food animals, we feel even more strongly that they should be raised outdoors in fresh air and sunshine, eating bugs and slugs, as nature intended. Unless you have a male of each species, their eggs will not be fertile, so they won’t hatch. Turkey and duck eggs are delicious for eating! I am glad you have discovered the tastiness of meat. Especially so of home raised. I am reading various posts and thoroughly enjoying your blog. Thanks for sharing this info, I want to add a few turkeys to my flock. I’m glad you’re finding the blog helpful! That’s why I write this stuff. How do you slaughter and prepare ( pick feathers) from turkeys. I never eat my poultry but since finding out they die young I’m going to try it. Also can you mate white Broad Breasted Turkeys and get poults? I’d suggest finding a YouTube video on how to do this. It’s way too much to explain here. Broad breasted turkeys cannot mate naturally because they are too big. They can’t get close enough to mate, so they have to be artificially inseminated. This is not easy to do, so most people just wait until they start strutting and gobbling, then they know they have males. 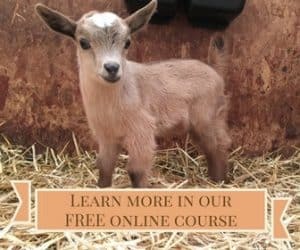 Can I artificially inseminate my Broad Breasted Turkeys. How do I do it? 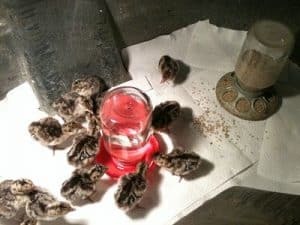 If you want to raise broad-breasted turkeys, you have to artificially inseminate them. They can’t reproduce naturally because they are too big to be able to reach each other and actually mate. I personally raise heritage breeds because I don’t want to do this, so I have never learned.